Digital is wonderful – it brings the world into your front room, it enables people to communicate across time zones, save money and find out more about the things that interest them. Digital is convenient, flexible, it can give you the information you need when you need it, and you can use it at a time that suits you. But digital isn’t always wonderful at everything. Human beings are (usually) better than technology at being patient, being empathetic, listening to what people really mean rather than what they say. Humans are good at encouraging others, inspiring others, and empowering others to do things they didn’t think they could do. The NHS is a wonderful institution and I was delighted to congratulate Matt Hancock as soon as he was appointed as the new Secretary of State for Health. He’s a good man and he understands both the power of technology and how many people still don’t know how to use the internet in a way that benefits their lives. Prevention being better than cure. They seem like three pretty good things to start with – assuming that a relentless focus on patients underpins all three. Although I’m passionate about tech, I am more passionate about people using technology, and not tech for its own sake. For over four years now, we’ve been working with partners to engage people who are more likely to experience poor health and lower life expectancy due to the wider social disadvantages they experience. In our first three years, we helped over 220,000 people who showed us that with the right support and encouragement they could change behaviours, and lift barriers to exclusion. Part of that behaviour change was helping them to use the best channel for them – such as the online NHS health information instead of a GP, or a Pharmacist instead of A&E. Our research showed that the group of people we supported in one year had the potential to save the NHS over £6 million in those 12 months alone. In phase 2 of our NHS Widening Digital Participation, we are working with some of the most excluded groups in the country to investigate ways that digital can make a difference. By targeting local Facebook groups in Stoke, we’ve have been able to increase the uptake of Breast Cancer Screening by 6% (13% in the most deprived wards) against a national drop of 4%. 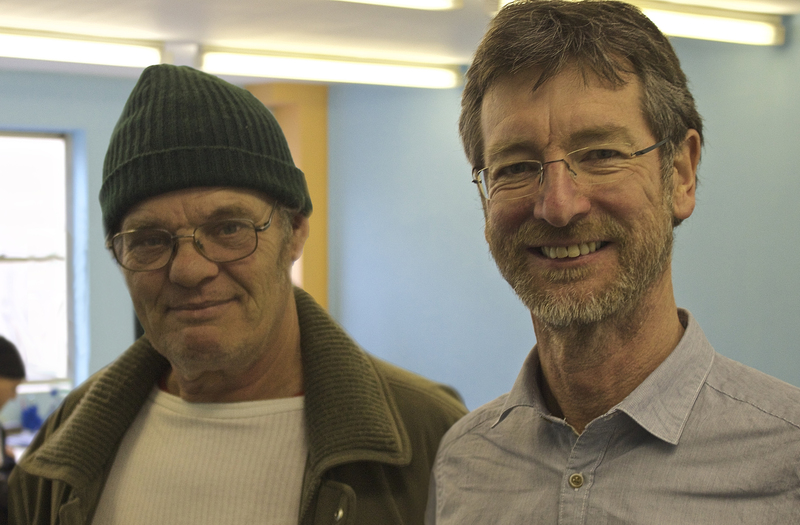 By providing access to trusted information through NHS Choices, the homeless community in Hastings have been taking medication at the right times, re-integrating with their GPs and even attending A&E when they have serious injuries – all of which wasn’t happening before due to a variety of mental health issues. By partnering GP practices with community partners in the Online Centres Network in Sheffield we’ve been able to show how patient engagement, activation and health transactions can all be improved through social prescribing and digital (as long as you don’t mention the word digital). We are so proud to be part of the Empower the Person workstream for NHS England. This recognises that designing systems, tools and pathways should leave no one behind. As Juliet Bauer, Chief Digital Officer at NHS England, says, “Technology is here to extend humanity, not replace it”. Social prescribing can be really effective, but it isn’t a silver bullet and needs to be implemented in the right way – it needs to remain informal and based on the needs of the individual, so implemented well it involves local community organisations, and it is a shared decision between both the patient and practitioner. A digital enabled NHS should offer a better, more inclusive, and 24/7 service, that is free at the point of use, as well as including Matt Hancock’s holy trinity of allowing better care for patients, easier service provision for clinicians, and saving the NHS money. And, if 90% of the people who are socially excluded are also digitally excluded, it’s critical that all citizens are also, at the same time, enabled and empowered to be able to and benefit from this wonderful digital world and the wonderful digitally-supported NHS that Matt Hancock, his team, and hundreds of thousands of NHS workers all want to see. What does it mean to stay happy and healthy? Some people would say it’s eating well and exercising, others would say it’s being able to stay ‘in the know’ and in control of existing health conditions. What these tasks have in common is that the internet can be used to make them easier. And that’s where our Widening Digital Participation project with NHS Digital comes in. This week we’re shining a spotlight on this project, not least because the project has been shortlisted at the Digital Leaders 100 Awards for Cross-sector Digital Collaboration of the Year, but also because we’ve engaged 104,300 people through this second phase of the programme so far since April last year. In the first phase (September 2013 to March 2016) we supported a total of 221,941 people to learn digital health skills. In the third year, through our research, we discovered that the behaviour change of people moving more of their health transactions online would mean potential annual savings of £3.7m in saved GP visits and £2.3m in saved A&E visits. That’s savings of £6 million in just 12 months. These savings alone represent a return on investment of £6.40 for every £1 invested in the programme. At a time when the NHS is increasingly strapped for cash, we’re happy to help them save a bit of money and alleviate pressure on services by teaching people to use the internet to manage their health. Just to be clear, we’re promoting the use of digital as one channel to help with how people manage their health, and this channel sits alongside the other telephone and face-to-face support people can and should continue to have access to, such as NHS 101, Pharmacists, GPs, Health Clinics and A&E. Our second phase (that started last April) has identified ‘pathfinder’ partners, that’s CCGs, GPs, Online Centres, third sector organisations, Councils and more with a specific idea to test if (a) it works and (b) if the idea can be replicated and scaled. What are our pathfinders doing? Digital Health on the High Street, Nailsea: Nailsea Town Council purchased the old butcher shop on the High Street, turning it into a community space that can help Nailsea residents improve their lives through engaging with digital technology and their health. They’ve engaged 870 people, supported 120 people in-depth and recruited 21 Digital Champions. Young Carers, MYMUP, Bradford: We’re working in partnership with MYMUP, local third sector organisations and education establishments in order to support young carers. MYMUP is an online platform that is helping support young carers with their resilience and mental health. We’re working with them to discover the ways that digital support can improve the lives of young carers and also increase access to health information for the people that they care for. There is so much more to read about what our pathfinders have been up to on our ‘micro-site’, so please do have a look. Good Things Foundation is social change charity. We believe in helping people to improve their social outcomes powered by digital, so through programmes like Widening Digital Participation the health benefits aren’t limited to reading NHS Choices or booking a GP appointment through an online booking system or ordering a repeat prescription for delivery to your home. It’s other things like reducing social isolation – learners who normally live alone and spend most of their time alone can get some company when they go along to their local centre to learn about digital – or improving their mental wellbeing and confidence by interacting with other people. The benefits to individuals, their communities, and to the NHS of the Widening Digital Participation programme are potentially huge. We’re looking forward to finding out the new and exciting ways that our next 7 pathfinders will help the most vulnerable in our society to become happy and healthy. Today I’ll be at the House of Lords, launching our final report on the NHS Widening Digital Participation in Health programme. Over the last three years of the programme, our aim has been to help people improve their digital skills, learn more about digital health, and improve their own health and wellbeing as a result. We have targeted those with least digital experience and most health needs in the heart of their communities. With all of the challenges we currently face as a society, and with all of the pressures on the NHS, giving people digital health skills may seem like it’s not that much of a priority. I’ll try and explain why it is. There are 12.6 million people in the UK who don’t have basic digital skills and these people are those who are most likely to be suffering from poor health. They are also those most likely to be further disadvantaged by age, education, income, disability, or unemployment. The fact is that there is a huge crossover between those who are digitally excluded, those who are socially excluded, and those at risk of poor health. The Widening Digital Participation programme aimed to see how action on one front could influence the others. Ron first went into Inspire Communities – a UK online centre in Hull and one of our pathfinder centres for this programme – because he was about to be sanctioned by Jobcentre Plus for not meeting his job search commitments. Ron was homeless, had a gambling habit, as well as serious mental health issues, including anxiety and depression. He was living in a tent on the motorway, on the occasional Pot Noodle and coffee. He was often hungry and cold, and his physical and mental health were going downhill. Part of the problem was that Ron’s relationship with his GP surgery had deteriorated, and he refused to go. With the help of Inspire Communities, he was able to look at NHS Choices for advice on managing his symptoms, and to find a new GP. He was able to register and make an appointment online without having to run the gauntlet of travel, receptionists, and other patients. Plugging him back into the healthcare system was key in helping to connect him to the wider support he needed – and digital was key in doing this. Now he’s found new housing, taking an active role in his own healthcare, meeting his Jobcentre Plus obligations and dealing with his gambling addiction. Digital matters. Digital health matters. And Ron’s story isn’t just a one off. Throughout the programme, we’ve found that giving people the digital health skills they need means they’re empowered to take control of their health, improving the ongoing management of chronic health conditions, and helping them to interact better with health and social care services. We’ve also seen how digital inclusion can improve the social determinants of health – with better digital skills improving prospects for employment, income generation, educational achievement, and social connections. 52% of participants said they felt less lonely or isolated, and 62% stated that they felt happier as a result of more social contact. More than half said they have since have gone on to use the internet to improve their mental health and wellbeing. On top of this, the programme has also shown that improving digital health skills has the power to reduce the pressure on frontline NHS services. By helping people to move non-urgent medical queries from face-to-face and emergency channels to online ones, we found we could potentially save the NHS an estimated £6 million a year, representing a £6 return on investment for every £1 spent on the programme over the last three years. In summary, The Widening Digital Participation programme – and the local partnerships between UK online centres and local health and care providers that it has nurtured – has been proven to drive up the quality of care and drive down both health inequalities and health costs, ultimately improving society as a whole. And that’s definitely a result worth celebrating. You can read more about the programme and download a copy of the report here: nhs.tinderfoundation.org. What were you doing in July 2013? I’ll tell you what I was doing; I was anticipating the start of something great for Tinder Foundation as we embarked on a partnership with NHS England. Long before we launched the now award winning Widening Digital Participation programme in the summer of 2013, we’d been talking internally about the correlation between health issues and digital exclusion. You can’t ignore facts, and the facts were showing a huge synergy between the two. Two years into the three-year project, and the facts once again speak for themselves. I’m so glad we’re on this journey with NHS England at a time when the shift towards digital by default services has become even more widespread throughout health services in the UK, and the danger for people suffering health inequalities to be left behind becomes even greater. Provided grants to support over 200 community partners (each year of the project) to deliver digital health literacy training and support to people wanting to learn more. The numbers are growing all the time, our partnerships – both local and national – are working. Great things are happening through digital. But, there’s so much more we can do. We’re well underway with year three of the programme and we’re looking ahead to what happens when we finish in March 2016. But, I don’t think of it as the end because the last three years we have laid the (strong!) foundations – it’s just the start. There’s been a lot of discussion in the last 48 hours around the fact Jeremy Hunt, whose views on health – and mental health in particular – never fail to reach the headlines, is to remain as health secretary. It also happens to be Mental Health Awareness Week. I am fortunate that my job allows me to see so many examples of the great work the NHS does through Tinder Foundation’s Widening Digital Participation Programme. If numbers aren’t really your thing, then I’d recommend watching this brilliant video and hearing directly from some of the people that have benefitted. Jeremy Hunt, you should watch this video and if you’re really pushed for time, fast-forward to 2:00 minutes to hear one of my favourite quotes from a woman who makes a lot of sense. I’m proud to say that the Widening Digital Participation Programme has been nominated for an award at the Digital Leaders 100. I’m so pleased that the hard work and dedication of our team, including the UK online centres, and NHS England is being recognised through this prestigious industry award. If you’ve got another couple of minutes please do head across to their website and give us a vote. On Wednesday evening I was on a train coming back from London and chatting to my colleague Alice about how important the internet, and good access to the internet, is to us personally. Alice had recently moved house and all her furniture was in storage, but she was happy as the broadband was connected and she had a beanbag to sit on. Alice and I had been to an event where about 60 social entrepreneurs, business people and delivery projects from around the world had been discussing the Why and the How to connecting the last 4.4 billion people who still can’t or don’t use the internet. In the UK we still have 10 million people who don’t have the basic digital skills to use the web. As part of my day job I get meet with many of the thousands of people that Tinder Foundation and our partners help every month, and I hear about the life changing effect the internet is having on new users who have: found work, saved money, been in touch with distant friends and relatives, no longer felt lonely, got healthier, and stopped rough sleeping. Scaling that up, a vision of connecting the 4.4 billion people unconnected is mind boggling. Many of the stories, I heard on Wednesday, of lives transformed were familiar to me: people getting new skills so they can find useful work, people finding a voice, people linking to essential services. But other success stories were about how to use technology to solve very different challenges. For example, Instant Network School from Vodafone Foundation helps children displaced by conflict access education resources via tablets and the internet. We heard from Internet.org about infrastructure solutions, free data to use basic Facebook and other public services for mobile phones in the developing world, and about digital literacy. There were common strands in our discussions. Such as technology is just the tool; what we really need to make change happen is to develop programmes importantly involving users and helpers that result in behaviour change. We talked about value and cost. In the UK I keep banging on about the people who just can’t afford the internet. For many people still digitally excluded in the UK, just like people in some of the developing world, the choice is an internet connected device or something else – where the ‘something else’ may be food or travel costs to get medical help. It’s just like the prevent or cure agenda: we never get truly focussed on prevention when there are so many people who need curing. I often feel hopeful and frustrated in equal measure. Bob Gann, from NHS England, and I gave a short talk on our Widening Digital Participation Programme. I brought it right back to the 4.4 billion people and told the story of just one of them – Ron, who used to live in a tent next to an A road just outside Hull. Too often the big numbers obscure the fact each statistic is a person and each time they are empowered to change their life for the better that’s one more life improved. Ron’s story has been told to the UK Secretary of State for Health, Jeremy Hunt, and this shows that one small change in one life has the potential to change the opinion of the man in charge of the NHS. We have to look bottom-up but we also need to make sense of it top down, so we can scale change as well as learning from local practice. Bob and I talked about the Tinder Foundation Network Effect. How the thousands of hyperlocal partners we work with in our network achieve more because they are part of that network. Yes, it’s about products and services and platform and grants – the things we provide. But it’s about more than that, it’s about belonging to something bigger. Ron was helped by Inspire Communities in Hull; Inspire Communities’ work is very important. Southampton Library, and Starting Point, and Cook E-Learning, and the Bromley By Bow Centre, and thousands of other hyperlocal partners work is very important. They all tell us they know that by working with Tinder Foundation their work, their expertise and their efforts are all respected and valued, and they also tell us that they feel part of something bigger. We are all part of something bigger. Together we have a bigger impact than just working alone. That’s the network effort. Alice and I met people in India and South Africa who are working in a similar way to Tinder Foundation. We will keep talking. We now belong to a bigger network of people with a similar vision and tireless energy to keep going until we cross the finish line. 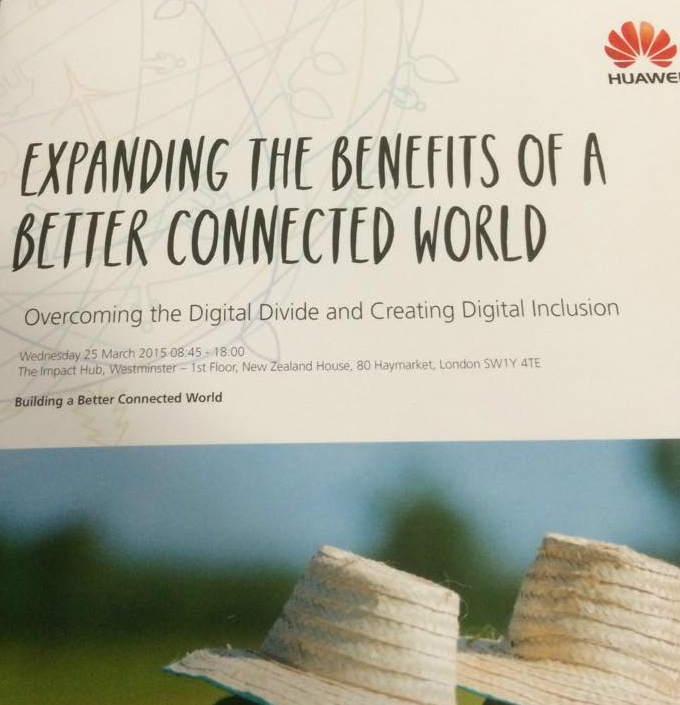 Yesterday’s event was hosted by Huawei, and they published a microsite a year ago with articles and further information about the 4.4 billion unconnected. …talking about digital inclusion that is. Well, that’s how it’s felt after celebrating some important milestones over the past week. 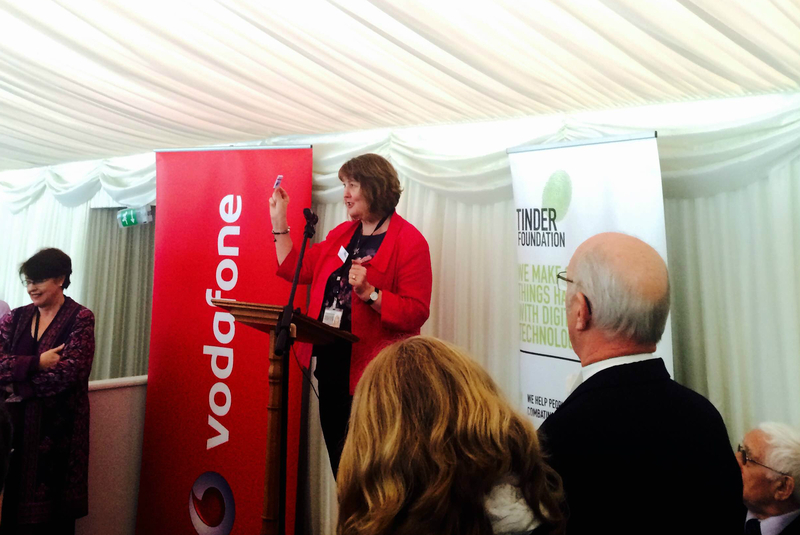 In my last post I talked about the Digital Leaders Annual Lecture and following on from that I wrote a post for the Digital Leaders blog – which just so happened to coincide with the Digital Democracy debate at the House of Commons, led by Meg Hillier MP. It was also the first time the public (me included!) 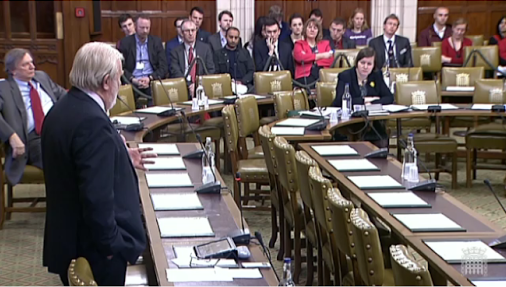 could use electronic devices during an MPs debate. I must admit (it’s something I talked about on Tuesday) when we first started working with Vodafone I was feeling pretty fed up of attending events to hear people saying that everything (digitally-speaking) was fine because “all the old people will die soon and everyone left already owns a mobile”. And I was definitely fed up of replying (or often shouting) that they were wrong. But the project with Vodafone has reignited my enthusiasm for mobile as there have been some really great results. 65% reported improvements to confidence and self-esteem. Overcoming loneliness and isolation was a big gain, with 67% saying they had better and more frequent communication with friends and family. And finally, on Wednesday we celebrated another important milestone in our Widening Digital Participation work with the NHS, where I was joined by Dr Ollie Hart. Ollie is a GP from Sloan Medical Centre in Sheffield and together with local partners in Sheffield he has been integral in referring his patients to the UK online centres “digital surgery”, run by the Heeley Development Trust. I’ll be blogging more about the Widening Digital Participation programme soon, but in the meantime take a look at http://nhs.tinderfoundation.org/. We’re also holding a great Tweetchat next Thursday to find out what GPs, CCGs and other health practitioners think of the Widening Digital Participation programme. You can find out more here, and so do join in if you’re interested using the hashtag #NHSWDP – we hope to see you there!